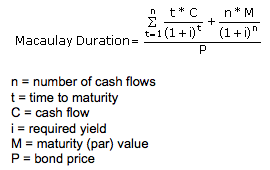 The HP 30b includes two bond duration calculations: the modified duration and Macaulay duration. These measure a bond’s price sensitivity to fluctuations in interest rate movements by giving what is essentially a time value of money weighted average time to maturity. Macaulay duration is calculated by adding the results of multiplying the present value of each cash flow by the time it is received and dividing by the total price of the security. The Macaulay Duration formula was created by FrederickMacaulay in 1938, although it was not commonly used until the 1970s.